Years ago, we started celebrating the end of the school week by going to Quik Trip right after school on Fridays. The kids started calling it Fountain Drink Friday. A few summers ago, one of the kids suggested Milkshake Monday and it just grew from there. We had so much fun thinking of things to do on each day of the week. I LOVE a schedule and I have found that my kids do too! We don't stick to this 100% but I really have found that it helps my sanity SO much. 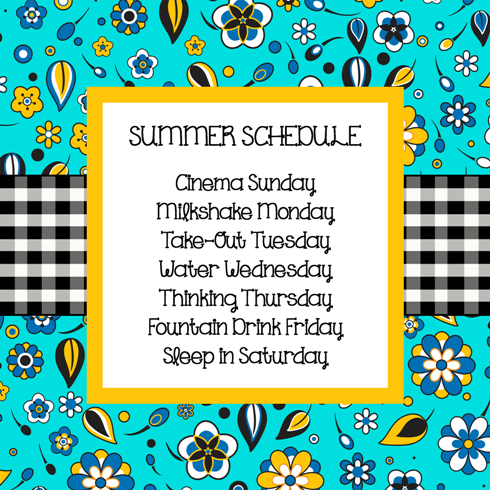 I don't feel like I should have to entertain my kids 24/7 and I still need to work during the summer so this schedule is a bit of a life saver! They are much less likely to complain about boredom or interrupt me while I'm trying to work if they know there is a milkshake coming their way. We try to do family movie night and usually it's watching something on Netflix rather than actually going to the movies. Sometimes we go out for milkshakes and sometimes we make our own. Sometimes we go get snow cones instead. My three littles love to eat out. We try not to do this too often so I love that it seems like a real treat to them. It could be breakfast, lunch or dinner and it's never fancy. We usually try to go swimming several days a week but on Wednesdays, we make a point to go for sure! On Thursday we go to the library. We always do the summer reading program so this is always a regular part of our week. This is the day that started it all and now we end the week with Quik Trip fountain drinks year round! My favorite day of the week!! Do you have a summer schedule? I'd love to hear about it or even feature it on my blog! I know there are lots of mommas out there stressing about keeping their sanity during the summer months! Anyway, Happy Tuesday! Hope you enjoy these product pics! Happy Birthday to my always singing, bust a move dancing, seriously sarcastic, oh so funny, pasta eating, baby loving, always giggling, bracelet wearing, beautiful inside and out, stays up too late, fun size fashionista. We ❤ u, Shoogie! We haven't touched the dollhouse since July when we did the Craft Room! We've talked about it a million times and we have really wanted to work on it but you know how it is...we just seem so busy all the time. Over the weekend, Nora begged for me to work on it with her so as soon as she got home from school on Tuesday, we got started on the girl's bedroom. Nora chose lime green stripes for the "wallpaper" and hot pink and turquoise for the furniture. We are still searching for a few odds and ends to make the room complete, but over all, we are so happy with the way it turned out. Most of the furniture came from Hobby Lobby. We just painted it in fun colors. The little pink chair was from our Pottery Barn Kids dollhouse furniture set. The black and white polka dotted rug is just paper that I printed. I love to put personal touches in the dollhouse. This "canvas" is a picture of Nora's arm candy! She's always wearing a ton of bracelets so I just snapped a picture and printed it out. She wrapped it around cardboard to make it look like a canvas. We took a cue from my Instagram feed and covered this mini hanger with sequins. The mattresses on the bed are wrapped in felt and the pillows are made from rosette trim. The chandeliers are always my favorite part! We couldn't decide what to do for this room and then Nora suggested covering the tea light in washi. It turned out perfect! This Michael's frame was just $1 and was already the perfect color. I think one of my favorite parts of the room is the tassel garland. If you are on IG or read blogs, you'll know that they are everywhere. I confess, it was a tedious project and Nora got a little bored and wandered off and I got a little obsessed and took way too long trying to perfect it. It doesn't hang as nicely as I would have liked but I don't think our little dollhouse Lalaloopsies mind. The little lamp is from Hobby Lobby...painted pink, of course. The kitchen is the only room left. Now that summer is almost here, I hope we can get to it soon. My phone camera froze last week so I decided to transfer all my photos to my computer to free up some space on my phone. While I was going through all the pictures, I found some pics of the April Crafters Bash. It was so much fun...I should have shared about it earlier but better late than never, right! Thuy always puts on a great bash! I love getting to be her helper!! This time it was held at the Owl & Drum. It's such a cute shop! Heather from Design Roots was there to teach calligraphy!! Next time, Thuy is taking her Crafters Bash show on the road! The next one is in Fayetteville, Arkansas!! I'm tagging along with her! Come meet us! !